Only four films in and Laika have already carved out a unique niche for themselves in contemporary animation. With their latest however, they up the stakes on so many levels, it’s quite dazzling. Technically, the way they now incorporate stop motion with 3-D animation continues to expand the horizons of what can be done. Secondly, and more importantly, here they leave behind the deliberately darkly comic worlds of Coraline and The Boxtrolls, and tell a magnificent epic tale of family and loss, that sees them leap to the forefront of today’s animated filmmakers. Based in ancient Japan, Kobu focuses on a young boy who tells stories of warriors and absent fathers, one and the same, intrinsically linked with history and tradition and family and love. At the start of his tales he warns his audience not to blink for fear of missing something remarkable – a mantra that director Knight invokes to us the audience at the start of his film. Quite wisely so. 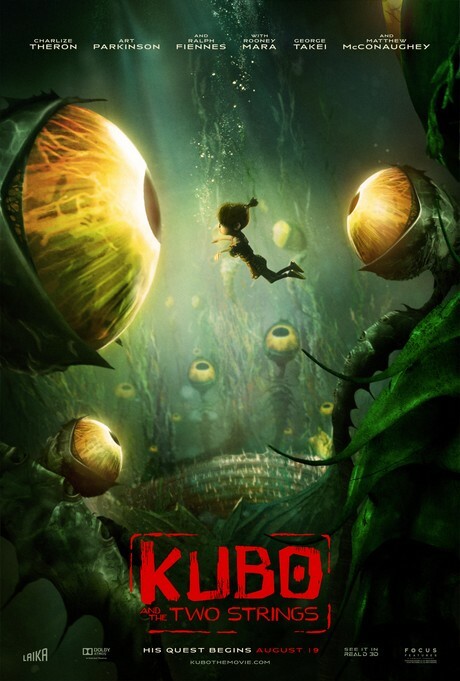 Kubo is a film that very easily works for all the family, capable as it is of beguiling all ages. The voice cast is strong with McConaughey on impressive form as an oversized Beetle (or is he?) and Theron especially good as a wise if grumpy old monkey (or is she?) Lest anyone forget this is a Laika film, the darkness seeps in, (Ralph Fiennes take another villainous bow) but not in the blackly comic way the company has made use of before, but in a genuinely scary way that at its best evokes classic 1940s/50s era Disney. Warn your little ones (and yourselves) Rooney Mara’s floating Aunties are the stuff of guaranteed nightmares to come. The stop motion is amazing, the storytelling is first class, Kubo is both a step up and a leap forward.